Whether you're shooting 4K Ultra HD, 4:2:2 full HD or streaming to the web, the GY-HM250E does it all. 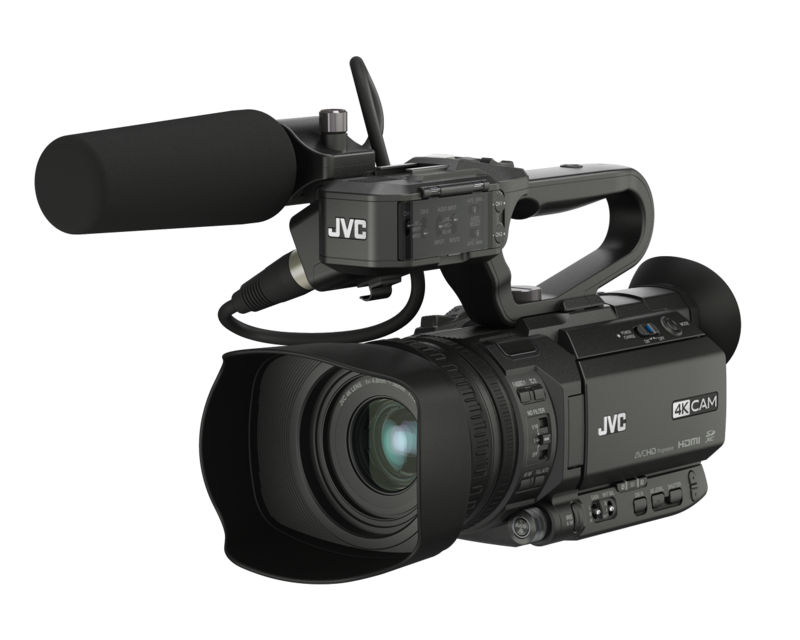 Its integrated 12x optical zoom lens and 4K CMOS sensor deliver stunning 4K Ultra HD recordings directly to SDHC/SDXC memory cards, together with dual codec advanced streaming technology. The camera also has a tele-macro mode for better focus on close objects and features lower-third and full-screen titling graphic solutions. 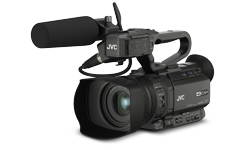 The camcorder comes with a wide variety of connectors to meet the needs of professional applications, including HD-SDI (3G) and HDMI. Secured digital connection is assured between external devices such as a recorder or switcher. Simultaneous output from both SDI and HDMI is also possible. This camcorder was built to deliver stunning, life-like 4K Ultra HD (3840x2160) video. 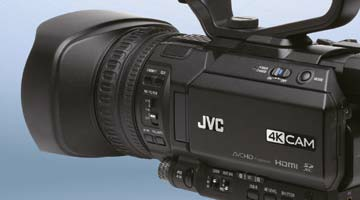 JVC’s 4K CMOS sensor with 12.4M pixels delivers high sensitivity and excellent performance over a wide range of lighting conditions. Details are crisp and accurate throughout the entire image plane. 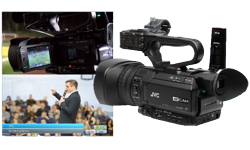 The ability to record H.264 4:2:2 24-60p at 50Mbps makes this an ideal camera for broadcasting and production houses alike. The colour accuracy of 4:2:2 enables the camera to deliver exceptional colour resolution even when images are in sharp contrast to the background. This is particularly useful when strong colours are in contrast to bright backgrounds, or in green screen usage. The camcorder allows high-speed recording at up to 120fps (59.94Hz) / 100fps (50Hz) for smooth slow motion playback. 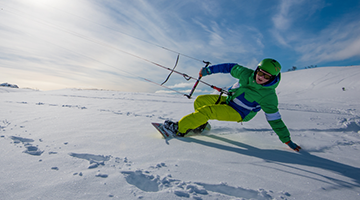 This can be used to create artistic effects or to review action replays when examining sporting skills. The feature is only available at 1920x1080 resolution only, and offers up to 1/5 slow at 24p mode. 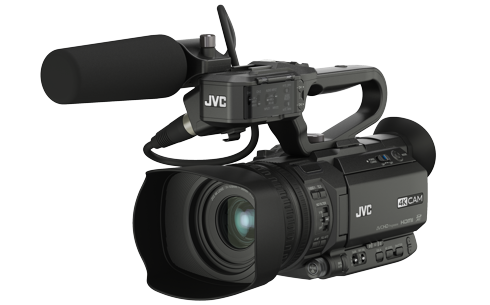 The detachable heavy-duty handle makes the camcorder easy to carry and also makes it simple to shoot from low angles, thanks to its built-in REC button with lock function, and zoom lever. 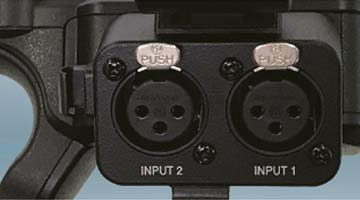 XLR audio inputs are provided for the attachment of a professional microphone or for LINE input, complete with Phantom power supply capability. 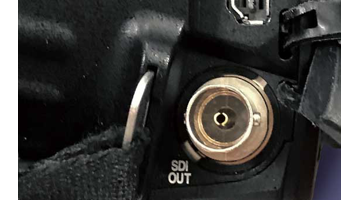 The connection to a network will be made by the USB Host Port of the camcorder (on the right back end side of the camcorder). WIFI dongle / 3G/4G dongle or a CAT Network adapter.The Adapter you going to be use must be a registered Adapter (see attached compatible list), cause all of these Adapter needs dedicate drivers, which to be implemented into the camcorder.In the case for LTE adapters, there must be done a pre-set of these dongles in your local PC first! Please Note: Sometimes the Manufacturers change the Revision of the Chip-sets, but product name not changed, we can´t track such issues so may its possible that such a dongles even its mentioned here, may not work. The Adapters below are work able in the 2,4 GHz and 5 GHz infrastructure. so far works with Telekom/O2/Vodafon , others not tested yet.